“For more than ten years the Greek economy experienced high GDP growth rates... was however largely based on increases in demand, fuelled by the easier availability of credit to enterprises and households at the lower interest rates which accompanied the adoption of the euro”. (1) How do the Greeks expect to have a positive nominal GDP growth when the economy is still uncompetitive and tax increases and wage / pension freeze (at best) are going to weigh on an economy which has been geared for so long towards consumption? (2) The euro has not been an instrument of convergence but of divergence since interest rates did not reflect the competitiveness of each eurozone country but a melting-pot hiding large discrepancies and not providing any incentive to converge due to the lack of stringent enough and automatic rule’s enforcement of the Stability Pact. Beyond more fiscal and social austerity measures, has Greece any additional revenues they could fund? I see two sources: selling state owned assets estimated to represent EUR 9.2 billion (figure rather optimistic to obtain when you are a well-known distressed seller) and multi-years pre-payment of EU structural funds (everything is possible in Brussels to save face - it would be counterproductive and disastrous for the EU credibility on the world stage). Overall, it will not be enough. First, 45% of the progress comes from a deep reduction in the Public Investment Program which, by the way, is due to slightly increase for 2010; at the current monthly spending, Greece is EUR 6 billion behind. So do not expect any improvement to come from this item; to the contrary, there is a lot of catch up to do by the end of the year to reach the EUR 10.3 billion spending contained in the SGP. It is quasi- impossible to project the success or failure of the SGP measure being implemented or the additional cost of any deviation in unemployment numbers from projections. What is less difficult to assess is the reality of GDP growth and therefore the level of debt requirements and whether the eurozone and IMF subsidy will be enough or not. I do not believe one second that Greece will have a positive growth in 2010; commentators and analysts are broadly discussing about a 4% GDP contraction. SGP alternative scenario: the debt/GDP ratio continues deteriorating, whilst at a slow pace. This is obviously overly optimistic since any negative delta compared to the baseline scenario would translate in lower tax revenues which are not taken into account in Markets & Beyond calculation. The additional debt is rather sustainable in 2010 and 2011 marginally and increases the debt/GDP ration for the 4 years under review. I do not take on-board this scenario either. Markets & Beyond scenario: the situation is unsustainable and the GDP projections are quite aggressive and do not take into account lower tax receipts. This will result in a default that would occur at the latest in H1 2011 (and probably by March 20 or May 18 2011 when two bonds are maturing – EUR 8.6 and 6.6 billion) but for additional financing from the IMF and other eurozone countries (it was reported last week that Axel Weber, the Chairman of the Bundesbank, said that EUR 80 billion would be required in 2010). Either Greece will default abruptly (not my scenario) or its debt payment rescheduling / will be negotiated (my scenario). The rescue package, if finally delivered (watch Germany), will not be enough to plug the widening gap; it is merely buying time and any reprieve will be short lived. The EU, the IMF and Greece should prepare a managed default and start discussing with creditors, which are mainly European (this should facilitate negotiations), to reschedule the debt and the haircut they will need to take (in my view in the 50% region to make the debt burden manageable for Greece and be within the 60% zone of the Maastricht criteria). As the 15 Parliaments of all eurozone countries must approve the bilateral credit lines (and I am not convinced that all will do), the IMF will be the first to provide the lifeline. Greece failed to convince the market and with a reason; Mr. Papandreou, Greece Prime Minister, in a public TV address said: the activation of the EU-IMF. rescue plan “will send a strong message to the markets that the EU is not playing their game and will not leave its currency at risk.” Really? Markets are playing games? Markets created an unsustainable situation in Greece? Markets are the civil servants demonstrating against austerity measures? Markets are fudging national account numbers? Markets just analyze facts and then act. Markets don’t live in fantasy land. Does this solve the Greek crisis? Not at all; the eurozone just gains more time hopefully to organize the default of Greece. Like in other European countries, civil servants in Greece are resisting change. They already warn that they will not accept any additional austerity package, that will be necessary anyway. Moody's Investors Service, the ratings agency, downgraded the government bond ratings of Greece to A3 from A2 and placed them on review for further possible downgrade: credit rating agencies always behind the risk curve… (Fitch having fired the first shot late last year merits some brownies). Yesterday’s Eurostat release of provisional 2009 budget deficits across Europe outlined that Greece will not survive this crisis without a very rapid lifeline: the Greek deficit it now stands at 13.9% of GDP vs the latest revised number of 12.9%! But this is not the end of it: Eurostat has reservation on the quality of Greek data and both the deficit and the debt/GDP ratio could be revised upwards. 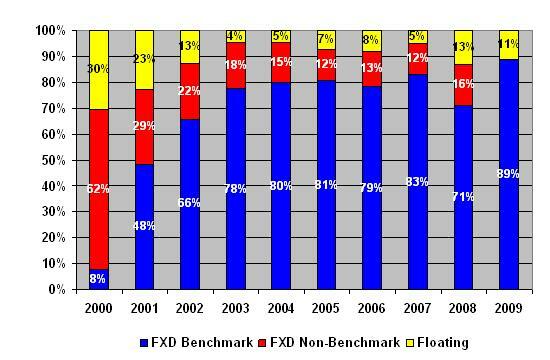 The situation is worsening as the analysis of Q1 2010 execution program shows and numbers are changing all the time. The credibility of the EU is damaged each time we go round the same boring course. The great favor Head of European States can do to Europeans is to organize an orderly default of Greece; the time for a rescue has passed. Once again, instead of pointing the finger at speculators supposedly responsible for the current crisis (imbalances attract speculators not the other way around), European politicians should have faced the reality, analysed it correctly and acted accordingly instead of failing lamentably. Greece sold EUR 1.95 billion 13-week Treasury bills today yielding 3.65 percent, more than twice the level of the previous sale in January (1.67%). The country still needs to EUR 10 + billion by end of May to finance maturing bonds and the deficit. This seems to confirm my reasoning: investors are ready to finance Greece short term for a good yield. I doubt they will finance Greece long term, hence the importance of the May deadline. The yield on Greece’s 10-year bond reached 7.82 percent today, the highest since before the start of the euro, and more than twice comparable German debt. As indicated in a recent article on my blog Thursday April 8th, the end of the game was to be decided within a week. On April 11th, after spreads on Greek debt had soared and the first signs emerged of a possible run on its banks, the panic mode button was on within the Euro-zone. Under the euro zone's rescue formula, Germany would have to supply about €8.4 billion of the loans for Greece - equivalent to more than €100 for every person in Germany. This assumes that it will not be successfully challenged before German courts. 2. Why this rescue package was so urgent? By April 16th, Greece had to refinance 26- and 52-week government bills, and it was clear that either it could not raise it in the markets, even at punishing rates (7%+). This was seen as politically unacceptable by other euro-zone countries (France being at the forefront) and triggering a spilling effect beyond Greece. The trick worked: Tuesday, Greece raised 1.56 billion euros in a heavily oversubscribed auction for 26- and 52-week government bonds that effectively carries a European Union guarantee. Whilst rates were below the ones prevailing a couple of days before the weekend agreement, yields were still high at 4.85% for the 52-week bill and 4.55% for the 26-week bills compared to respectively 2.2% and 1.38% on January 12. In addition, yields on debt with maturities of two or more years were still at least 6 percent in Tuesday trading, meaning the government will have to pay a high price as it seeks to refinance EUR 40 billion more in debt this year. 3. Will it be enough? The combined IMF and euro-zone rescue package will be enough to cover Greece remaining debt funding requirement for the rest of the year. European countries concluded, some reluctantly, that continuing to support Greece is less costly than letting the country go under. They bought (very little) time, nothing more. The breathing space created by the implicit bailout of Greece seems to be running out of steam already. According to Market News International, Friday, Greece 10-year spreads were widening out and trading at +408bps vs +401 bp Thursday. This yield spread has widened by around 85 bp since positive reaction by financial markets to Sunday's Euro-zone announcement. The details of exactly how the EMU and IMF portions of the plan would mesh together have been vague to non-existent. In addition, conflicting comments from EU members, reports of potential delays and legislative requirements needed to trigger the EUR 30 billion worth of loans put on offer by EMU governments, have pushed spreads wider as Athens now looks like it won't issue it's dollar-denominated bond after it begins its roadshow in the United States on April 20. Let’s have a look at the 2010 Greek State Budget. 41.5% of ordinary budget revenues come from borrowing and 62.5% of investment financing. The national debt as of 31/12/2009 stood at EUR 298.5 billion and a total sovereign exposure of EUR 324.3 billion if EUR 25.8 billion state guarantees are added. The Stability and Growth Program is projecting EUR 24 billion new borrowings to plug the deficit (EUR 39 billion in 2009) – EUR 5.2 billion decrease coming from 2 non-recurring items. These few numbers show the dead end in which the Greece is. Interest payments represent roughly 5.4% of GDP; in fact this number will be higher since interest rates on the Greek debt have dramatically increased since the budget was established. The sheer size of the problem facing Greece, beyond the burden of debt, finds its source in generous retirement and social benefit unfinanced by an uncompetitive economy: altogether they represent EUR 28.7 billion, i.e. 1/3 of the budget. Furthermore, from what I read (is it part of a Greek marketing campaign? ), tax collection is very lax, and this could bring EUR 10 billion in state revenues if properly addressed. Greece is facing insolvency with interest payments at 5% GDP, 113% Debt/GDP and 12.9% public deficit in 2009, to be reduced to 8.7% en 2010. The Greek government has based its plans to shrink the budget deficit on a modest economic downturn of 0.3% this year (nobody with common sense can believe this). UBS forecasts a plunge in GDP of 5% this year and next as cuts in public sector wages and other austerity measures feed through into the broader economy. If so, Greece could become caught in a vicious circle where declining output undercuts attempts to reduce the ratio of borrowing to GDP. The debt burden would increase at the same time the government’s ability to pay was declining. Half of the improvement during Q1 2010 budget deficit is coming from the reduction in the Public Investment Program ("PIP"), which is 10% of the overall budget: scope to find additional cuts in coming quarters from this side is therefore limited particularly as PIP is expected to increase this year. "Even with a fiscal adjustment worth 10% of GDP over the next five years, Greece will either need more official loans for longer than the current rescue package promises or will have to “restructure” its debts ... Even on optimistic assumptions, we reckon Greece will need €67 billion or more of long-term official loans in the next few years. Its debt burden will peak at 150% of GDP in 2014." Ultimately, Greece’s fate rests on the ability of Mr. Papandreou and his government to create a more competitive economy. However, as a euro member, Greece cannot take the traditional route to competitiveness in world markets and devalue its currency to cut the price of its exports; it can only play on costs, i.e. mainly wages and other social/retirement benefits: this will be long and very painful, if successful, whilst keeping the euro. Euro-zone governments hope that the rescue package will never be used and will act as catalyst for investors to continue financing Greece at not too punishing rates. Whilst it will work at least for short term financings -hence the success of the 26 and 52 weeks bills issued last week- I have doubts beyond. Greece cannot reach a 3% budget deficit by 2012 (or numbers will be fudged, tricks found at the European level to save the Saint Graal of Euro-zone). European countries cannot continue financing/backstopping Greece for ever, particularly when many have problems of their own and the Euro-zone economy will continue to underperform the rest of the world. This bailout does not address the real issue: the gap of competitiveness between economies of the Euro-zone, the lack of control of statistics provided by countries (Bulgaria recently announced that it lied on its 2009 deficit and therefore was postponing its application to the euro), and the absence of social and fiscal convergence. Many of these countries joined the EU or the Euro-zone with different motives: for example, former soviet bloc countries to stir away from their former mentor and take advantage of generous funding, Club Med countries to avoid fiscal discipline and increase competitiveness by hiding behind the euro that resulted in incredibly low cost of financing of their public deficits. None of these groups are either at the same stage of development, fiscal discipline and competitiveness or share the same objective. The one-fits-all is at best a fallacy, at worst a fraud, without fiscal coordination, control and enforcement. It will not last for ever if reality is not dealt with by European governments. Germans are going to be fed up to finance Europe without any return. The past month of Greece-related negotiations has illustrated that the institutional framework of the Maastricht Treaty and the Stability and Growth Pact has failed to enforce better fiscal coordination. This will need to be addressed via a significantly more binding Stability and Growth Pact. However, as noted in my letter to the President of the Eurogroup, improved control and enforcement tools remain conceptually incompatible with fiscal sovereignty. Overall, the fiscal situation remains highly uncertain. 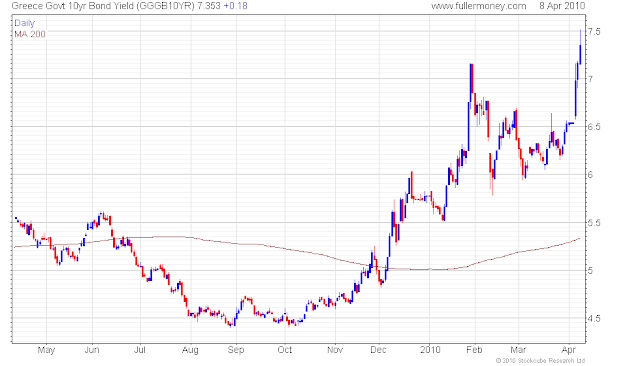 Greece’s problems could drag well into 2011, when the next heavy maturity schedule is due early in the year (~EUR 28 billion). So far, very little evidence on the success of the fiscal consolidation program has become available. Debt sustainability remains another issue that could become increasingly important. Greece will not default in 2010 and probably not until mid-2012, IF Germany involvement is not successfully challenged before courts. 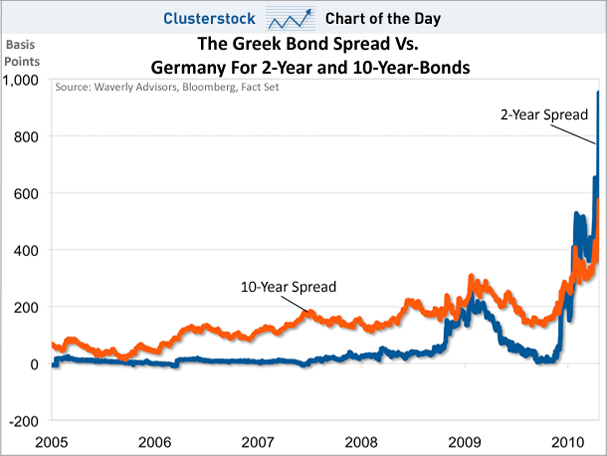 For the non-hart fainted fixed income yield seekers, invest in short dated Greek debt, particularly at time of stress when spreads increase. Personally, I prefer large companies with sustainable dividend payment to get yield. Today's chart illustrates rallies that followed massive bear markets. For today's chart, a 'massive' bear market is defined as a decline of greater than 50%. Since the Dow's inception in 1896, there have been only three bear markets whereby the Dow declined more than 50% (early 1930s, late 1930s until early 1940s, and during the very recent financial crisis). Today's chart also adds the rally that followed the dot-com bust during which the Nasdaq declined 78%. One point of interest is that the current Dow rally has followed a path that is fairly similar to that of the Nasdaq rally that began in late 2002. It is also worth noting that each rally lasted from about 300 to 370 trading days and then moved into a trading range/choppy phase that lasted for a year or more. In the end, the current post-massive bear market rally is by no means atypical. I continue to believe that we are in a bull market and not in a bear market rally. After the (absence of serious) decision taken at the Eurogroup meeting in Brussels where disagreements between Germany and France appeared wide opened despite all the rhetoric contained in the press release, it is time for countries of the eurozone to show their hand, and it is weak. 10 year yield on Greek Government bonds surged above 7%, 1 year CDS above 650 bp (175 bp more than Wednesday or +35%) and 5 years CDS are in a vertical push above 450 bp – higher than Iceland for the first time -, around 50 bp more than the recent February peak and 150 bp above late March level (+50%). Meanwhile the spread between Greek bonds and German bunds is at its highest at 446 bp since the Euro made its debut in 1999. In addition, according to the Greek central bank, local savers transferred about €10bn of deposits (+/- 4.5 per cent of the total in the banking system) out of Greece in the first two months of the year and George Papaconstantinou, Greek finance minister, said on Wednesday that the banks “have asked for access to the remaining funds of the support plan” or €28bn of government money put together during the 2008 global credit crunch. My view is that in this environment, Greek banks have no longer access to the market even for short term financing. When the world largest bond investor has such a comment, you bet that markets will not put one cent on Greece at 7% or 8% or 9%. (3) Assuming an additional 3% cost of borrowing on the EUR 27 billion to be refinanced in 2010, it adds EUR 800 million. All together, it represents a supplementary cost of +/- EUR 3.4 billion for the budget, wiping out 70% of the 4.8 billion additional austerity cut announced by the Greek Government early March (all these are assumptions since I did not find any information regarding swaps on the Greek Public Debt Management Agency web site, but I am pretty sure I am conservative). And the Q1 10/Q1 09 40% narrowing of the budget deficit to EUR 4.3 billion will not solve the insolvency Greece is rapidly facing. Liar’s poker players will have to show their hand soon, very soon, and maybe as soon as next week. The eurozone 25th March gamble failed spectacularly as expected: politicians do not want to understand that markets want hard facts not rhetoric and expedients. 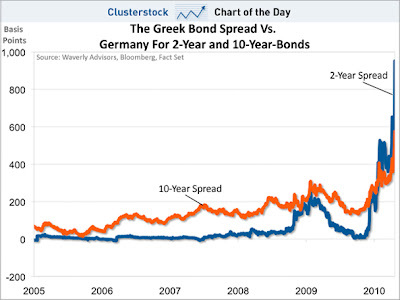 TAlphaville: Is this Greece’s point of no return? US real estate housing market: a case for reasonable optimism or is it just noise? Many times, I outlined that the crisis started with the imploding housing bubble and will end with it. We are no entering into the 3 rd year of implosion according to the Case-Shiller Index. So, where are we now? Are data for the past 6 months showing the beginning of a real improvement or are they just noise? 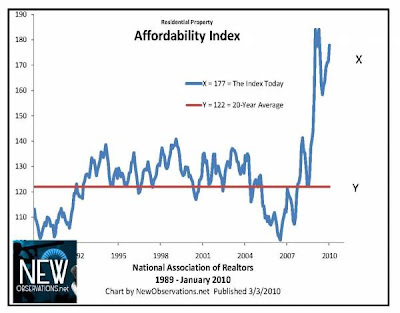 It is during the summer 2006 that prices started to decline according to the Case-Shiller Home Price indices. The fall has been steep and deep, and in some places dramatic, with falls running in the region of 50% in Nevada or Arizona for example. Last year the US experienced the largest annual fall in real estate prices, hit the highest number of delinquent mortgages measured, witnessed a record 918,000 homes taken in foreclosure, and 11.3 million home owners now own negative-equity. Absolute data are still bad, but trends look better. Case-Shiller data through January 2010 show that the annual rates of decline of the 10-City and 20-City Composites improved in January compared to December 2009, and are flat compared to a year ago. Annual rates for the two Composites have not been this close to a positive print since January 2007, three years ago. However, the rebound in housing prices seen last fall is fading and prices have experienced small price decrease for the past 4 months. Whilst the picture is at best mixed, one interesting graph is the Residential Property Affordability Index which shows that affordability is at its best for 20 years. This is consistent with falling house prices and improving household’s balance sheets as showed via several Q4 2009 indicators like the household debt service payments as a percent of disposable personal income à 12.6% or household total financial obligations down to 17.5%, both back to 2000 levels. 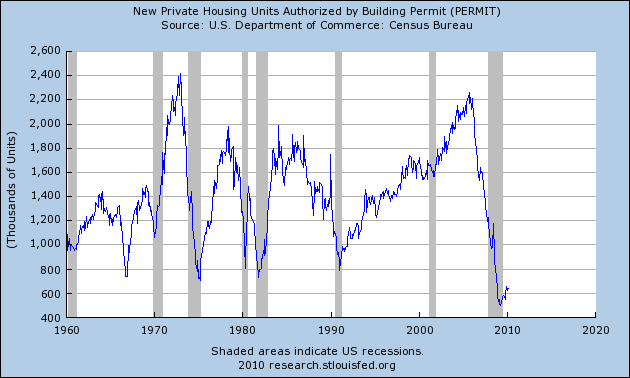 Housing starts and new private building permits (which is more forward looking) whilst slightly recovering remain subdued and well below historical average: this will not add pressure onto the market. Mortgage delinquencies are at a record high 15.02 percent (Q4 2009) according to the Mortgage Bankers Association — meaning an estimated 8.4 million families do not pay their most important bill. Foreclosure has therefore been a dominant feature during this housing crisis, reflecting (1) the low credit quality of mortgage borrowers and (2) the depth of the financial meltdown and unemployment surge. However, the delinquency rate for mortgage loans on one-to-four-unit residential properties fell to a seasonally adjusted rate of 9.47 percent of all loans outstanding as of the end of the fourth quarter of 2009, down 17 basis points from the third quarter of 2009, and up 159 basis points from one year ago when the market was melting. The percentage of loans on which foreclosure actions were started during the fourth quarter was 1.20 percent, down 22 basis points from last quarter and up 12 basis points from one year ago. “We are likely seeing the beginning of the end of the unprecedented wave of mortgage delinquencies and foreclosures that started with the subprime defaults in early 2007, continued with the meltdown of the California and Florida housing markets due to overbuilding and the weak loan underwriting that supported that overbuilding, and culminated with a recession that saw 8.5 million people lose their jobs,” said Jay Brinkmann, MBA’s chief economist. I am of the opinion that despite the end in June of the $8,000 tax credit given to first-time buyers will not result in a double dip for the housing market at a time when the nascent economic recovery developing across the US, as per the recent data published over the past few weeks, and low interest rates. I believe that we have reached (or are near) the trough of the US residential real estate market. The falling spiral is no longer self-fulfilling and the economic environment is improving. Low interest rates, better employment data and rebuilt household balance sheets are keys to the recovery and are all going the right way.